- less than 3½ hours from Paris! - just 1½ hours (by car or by coach) from Nice! cross-country skiing centres): A8 motorway (exit Digne/Grenoble) and D 6202, the road into the upper valleys (Var, Daluis, Cians, Tinée and Vésubie). For the Turini-Camp d’Argent ski centre: A8 motorway (exit Nice-Est) and Paillon Valley. For the Castérino cross-country skiing centre: A8 motorway to Ventimiglia (Italian border) and Roya Valley (direction Tende). The roads in the hinterland of the Alpes-Maritimes are kept up year round and cleared of snow in winter. From the Nice Côte d’Azur International Airport, 2nd busiest airport in France, shuttle buses make access to the resorts is particularly easy. 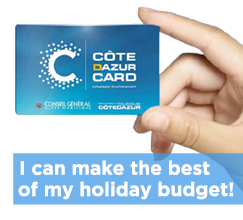 Links to the resorts from Nice Côte d’Azur Airport are provided in around 25minutes. From the major coastal towns, many coach companies provide regular service to the main resorts. For the Mercantour resorts, Santa Azur provides regular service from the coach station of Nice and the Airport. Service to Valberg is provided by the Broch coach company. During the winter season when the resorts are open, take advantage of the Ski Bus (return ticket + ski pass) for the resorts of Auron, Isola 2000 and Valberg. Nice/Digne via the Var Valley (on the picturesque “Train des Pignes” run by the Chemins de Fer de Provence). From January to March, take advantage of the Snow Train (Train des Neiges) to reach the Nordic skiing centre of Casterino.